Sirius Rocketry Eradicator (29mm) [SR S-0017] - $79.95 : Sirius Rocketry Online Store, For the Serious Rocketeer! 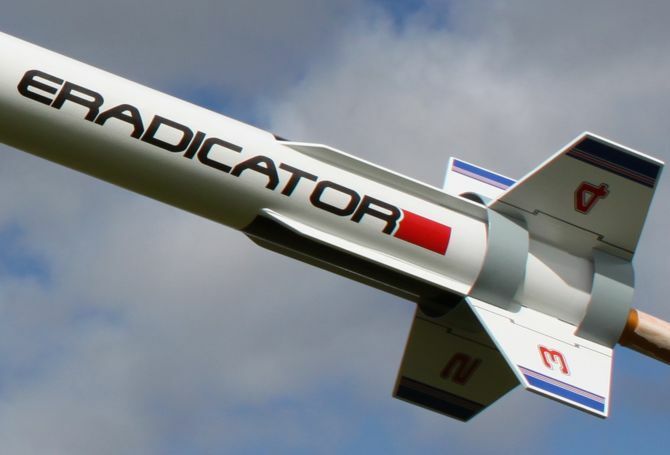 The Eradicator is the latest in our "Transition Series" of kits; kits that can be flown on model rocket motors, yet can also be flown on high-power motors to help you transition into high-power rocketry. The Interrogator G was the first example of such a kit, the Eradicator is the latest additon to the line. It flies great on F and G motors, and plenty high on them too. But if and when you want try for your Level 1 high-power certification, the Eradicator can comfortably fly on an H motor with its 29mm mount! - Heavy-wall body tubes to stand up to the rigors of higher-impulse flight. - Precision laser-cut aircraft plywood fins and centering rings. - Unique strake/ring/tail fin configuration. - Two full-color decal sheets. - Durable ripstop nylon parachute from our friends at Top Flight Recovery. - Durable 400-pound test Kevlar™ shock cord mount and generous elastic shock cord to soften the stress of deployment. 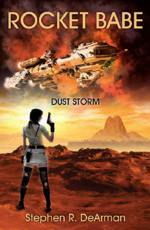 - A detailed 12-page instruction manual that Sirius Rocketry is famous for. It includes clear step-by-step illustrations and several pages of suggestions and tips to help you make the most of your build. 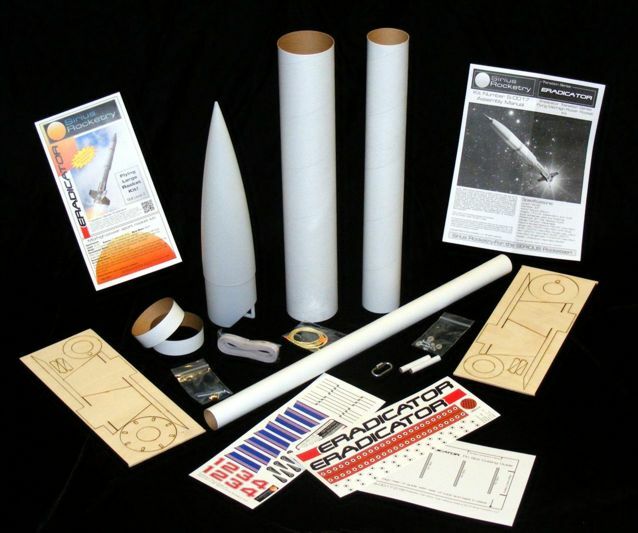 Our instruction manuals are based on 40 years of rocketry experience, and users rave about the things they learn about building great models from the tips in our manuals. - Many extras are also included so you do not have to purchase them seperately or modify the kit. Like a quick link for the parachute and positive motor retention hardware. These are just some of the things that are optional in many other kits. Both a 1/4" launch lug and rail buttons for standard 1010 rail are also included to give you the ability to launch on almost any club's equipment. The Eradicator will impress others with its stepped body tube diameters, ring tail fins, military/sounding rocket styling, loads of decals, and graceful flights. And you will have a great-looking rocket that can take you from beginners composite rocketry with F motors all the way to your Level 1 high-power certification with H motors! Now, anyone who knows us knows that we like them to go up low and slow and not so high that we cannot enjoy the whole flight. But if you want, the Eradicator can go out of sight! Weight: Approximately 17.3 ounces, dependent on adhesives and finishing. Features: Interesting fin-ring tail configuration; styrene plastic nose cone; 1/8" laser-cut plywood centering rings; heavy-wall main body tube and motor mount tube; Lariat™ Kevlar™ shock cord mount; 30" ripstop Nylon parachute with quick-link for easy parachute swaps; includes launch lugs and rail buttons, use either or both; two full-color waterslide decal sheets including unique "serial number plate" for each kit (no two alike); step-by-step illustrated manual with building tips. *High-Power motors require user high-power certification or certification flight attempt. 1/4" Launch Lug and "1010" rail buttons both included for versatility. AeroTech DMS H125-14A 2800' (853m) Trim adjustable delay down to 10 seconds. Skill Level: 2 - Some large model rocket/high-power rocket experience is helpful. Above: Close-up of ring/tail fins.